Great George Street. Photo: Destination Charlottetown. Carol and Vello Kass may have grown up and gone to school in Alberta, but soon after they first set foot in Charlottetown, the historic city became their home. Even as they lived elsewhere, the couple returned every summer, ultimately settling in Prince Edward Island’s capital for good when Vello retired from academia and surgical practice in 2012. Seaside boardwalk. Photo: Destination Charlottetown. “We like the lifestyle,” he says. With a population just north of 44,000, the picturesque city is “big enough to have all kinds of stuff that you might want,” yet small and friendly enough that you can strike up a conversation in the supermarket checkout line. Neighbours notice and check in if you disappear for a day or two. And whether you belong to a family that’s lived here for generations or have just moved here, “everybody belongs,” Kass adds. That accepting attitude is just one of the things that draws newcomers to settle in Charlottetown. Housing prices that are among the country’s lowest—an average of just under $200,000 for a single-storey home in October 2017—are another. “For people who sell properties off-island, moving here frees up substantial financial equity,” notes Harry Kielly. A lifelong Islander, he spent a decade teaching in the Far North and then he and his wife, Myrna, moved to Charlottetown after he retired for the third and final time. Kielly is now president of the Men’s Probus Club of Charlottetown, a social club for retirees that brings in guest speakers. Rental prices are also reasonable, although demand is slightly ahead of supply. “New apartment complexes are rented before the foundation is poured,” Kielly says. 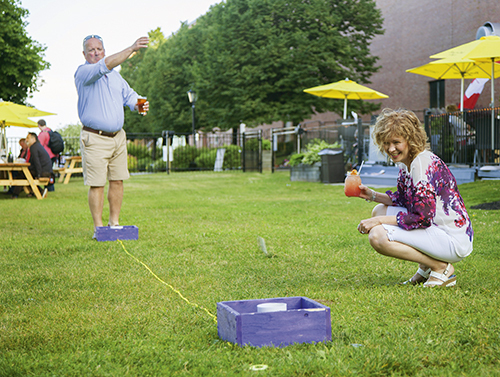 Lawn games in the Brak’Yard. Photo: Destination Charlottetown. 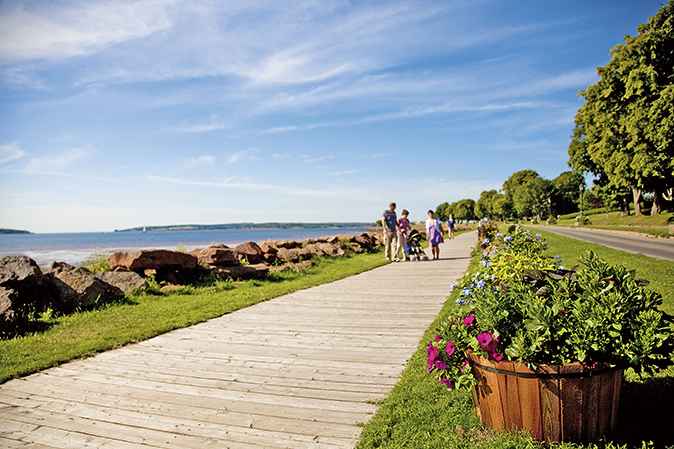 Of course, PEI’s beauty—from the seas of summertime lupines in shades of blue, pink, and purple to the signature red sand beaches—is a trait that entrances visitors and residents alike, and there are plenty of things to do while drinking it in, including golfing, kayaking, sailing, cross-country skiing, hiking, tending a community garden plot, and strolling along Charlottetown’s seaside boardwalk. For example, the railbed that traverses the island from tip to tip and its secondary spurs—435 kilometres (270 miles) in total—have been converted to a multi-use trail that’s closed to motorized vehicles. And in winter, the city floods a vacant lot by the harbour “and you can go skating,” Kass says. There are also a variety of indoor options for staying active, including arenas, pools, and walking tracks, and city-run classes in everything from judo and Pilates to bowling. For example, the Seniors Active Living Centre on the grounds of the University of Prince Edward Island offers a range of activities, including aquafitness, bridge, and outings to various destinations. “It’s within the city limits and there’s free parking,” Kielly says. 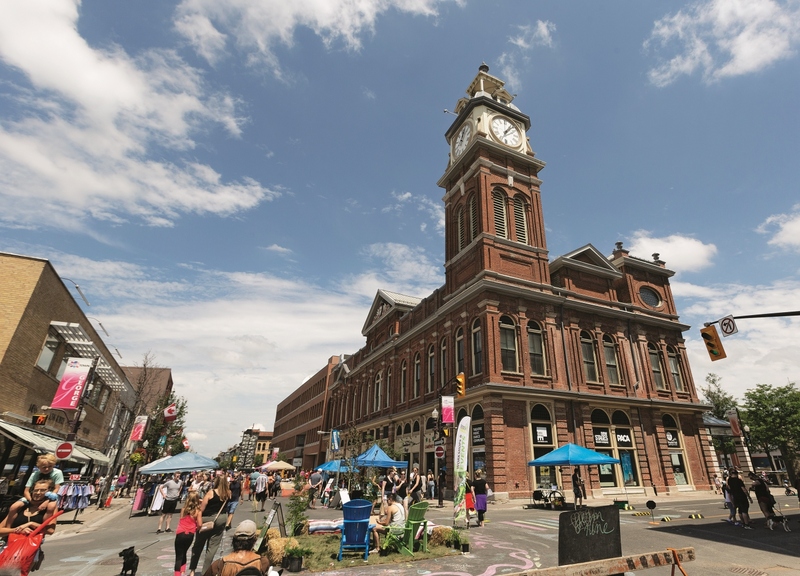 In addition, the city runs classes in artistic pursuits such as painting and creative writing, and continuing and part-time education is available through Holland College, the provincial community college. Holland College is also home to a culinary school that has transformed Charlottetown’s dining scene. “There’s a multitude of excellent restaurants here, and almost all the chefs trained at the culinary institute,” Kielly says. The city also boasts a number of culinary events aimed at attracting residents during the off-season, such as the month-long “best burger” competition in April and the International Shellfish Festival (September 13 to 16 this year), as well as wineries, craft breweries, and a farmers’ market showcasing the area’s other agricultural riches. “There’s always something to keep you amused if you like to eat,” Kass says. “Friends of ours tend to be amazed at the quantity and quality of entertainment available on the island,” Kielly adds, from a symphony to theatre productions at Confederation Centre and countless ceilidhs held around the island during the summer. “If you want to join the ceilidhs, take your guitar,” Kass advises. 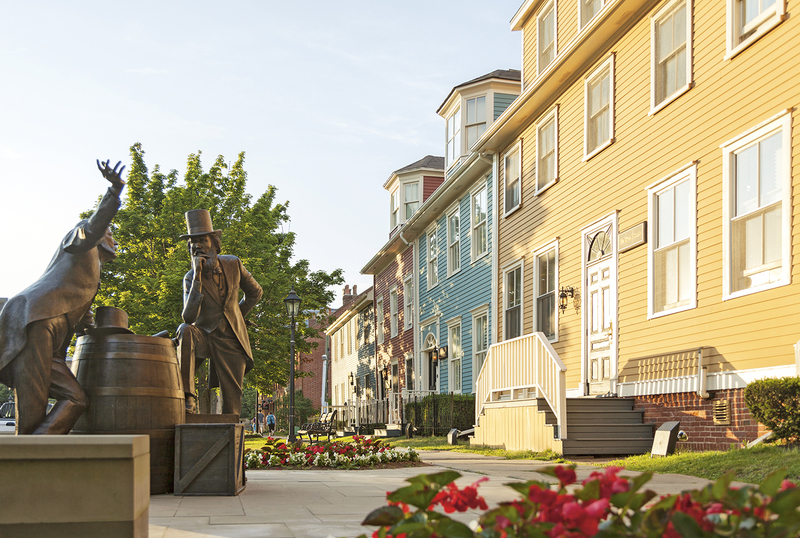 You can find evidence of Charlottetown’s rich history and artistic traditions around nearly every corner, including museums and historic sites such as Province House, the birthplace of Confederation. 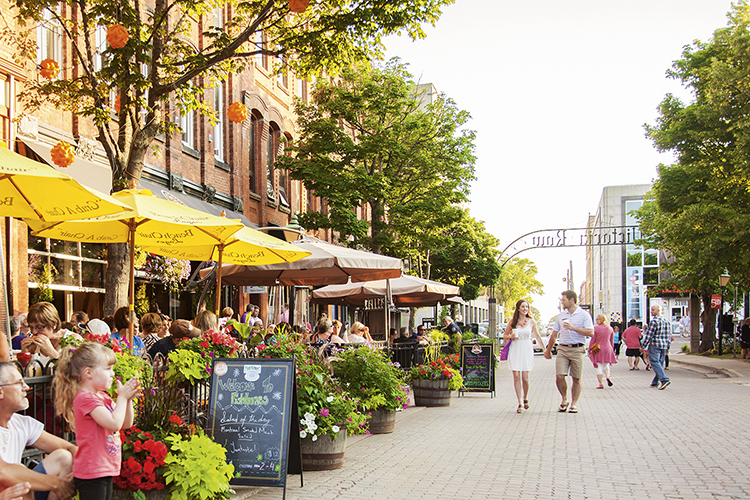 Victoria Row, a narrow cobblestoned street, is lined with some of the city’s most beautiful heritage buildings, which now house cafés, galleries, and shops. And a number of studios feature the handiwork of local artisans. Victoria Row. Photo: Destination Charlottetown. 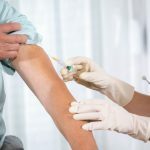 As for the medical care available, Kass, a retired surgeon, praises the calibre of expertise and care at the local hospital, pointing to his own encounter with a potentially deadly blood infection that was promptly and expertly diagnosed and treated despite complicating factors. “If you have a real problem and you go to Emergency, you’re looked after immediately,” he says. “You can be assured you’re going to get the best care.” Only cases requiring open heart surgery or neurosurgery are referred to other centres. 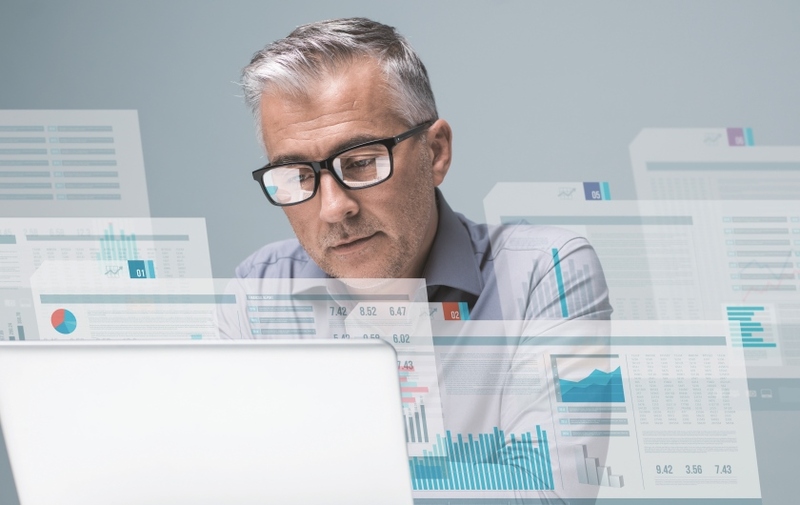 While there’s currently a waiting list for family physicians, work is under way to correct this situation, and in the meantime, “if you work on it, you can get a GP,” Kielly says.